Dark Chocolate & Whisky, who can resist this? The name Monty's, is inspired by Jamie Oliver's restaurant (now closed) of the same name. It was a member only restaurant, so it's not accessible to the common public and it did very well. One of the owners had such fond memories about Jamie's Monty's, that today, he named the restaurant which he found with a few friends, after it. So that's about the origin of the name. One of the most annoying nightmare about dining in Senopati area, is the debilitating parking problem, you see. It's either you have to park far away from the place you're going to, or pay the unofficial parking attendants, a rate that equals to 4 hours parking in the shopping malls, or surrender your car to the valet attendants, also for the same price. That is why, I hardly come to this area during the weekend (when it is most crowded), unless I really really have to. But luckily, Monty's solve that problem for us with its free valet service. The dark & sleek, 3 story building, will eventually have 2 levels dedicated for the restaurant and a few private rooms, and on the top most floor, will become a whisky bar. The first 2 floors are already open to the public, but the top floor is still coming soon. Why a whiskey bar, you ask? 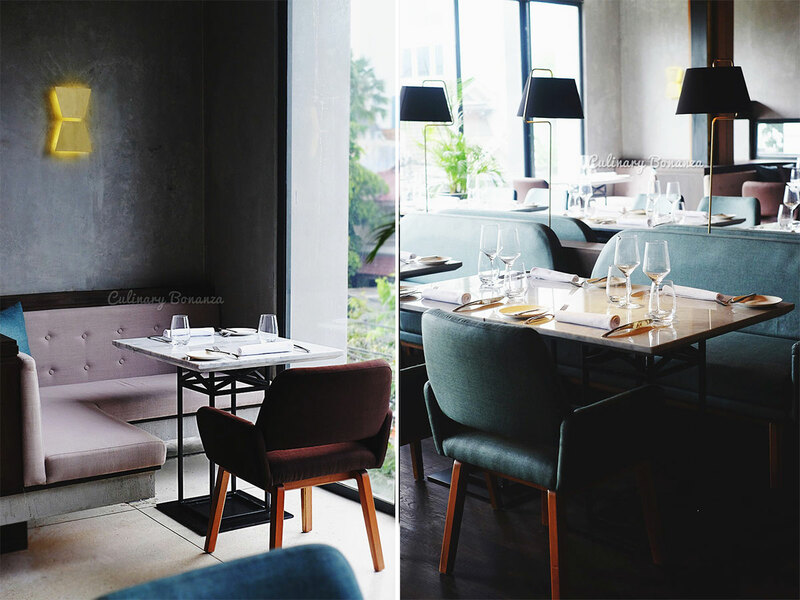 Monty's is after all, ran by Klabo group that also runs Nip & Dram, a whisky bar at Landmark building in Sudirman CBD, as well as Ivy Bistro & Catering. 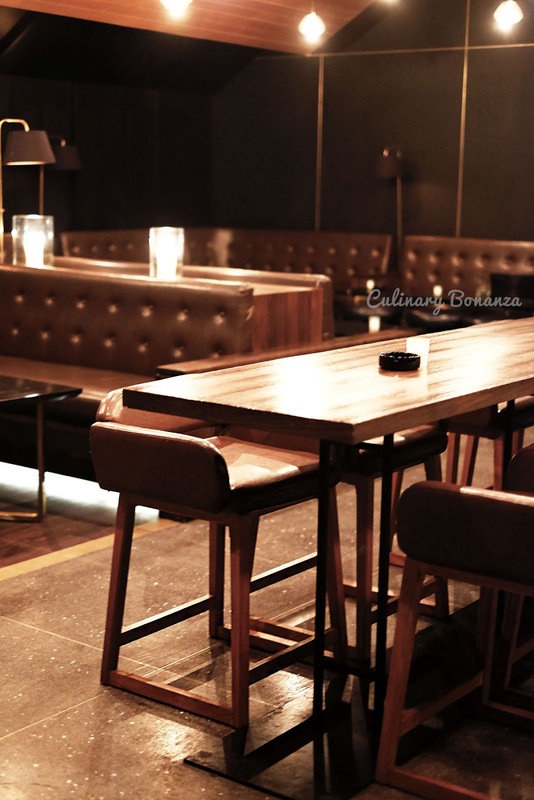 The interior is mostly dark hued, which emanates the classy and elegant feel. Therefore, I suggest that you come here dressed smart casual, so that you won't feel out of place amongst the black marble tables and impeccably formal dressed staff here. Pretty much similar layout to the first floor, except for two perfect spots in the corner overlooking the busy street outside. If you require even more privacy, there are a few private rooms to choose from. While waiting for the dishes to come, a staff would ask your choice of bread, which will be served with paprika spread and truffle butter. Truffle butter, served to compliment the complimentary bread, where in Jakarta can you find this? Not even in fine dining restaurants at five star hotels! It's was as divine as its name, and I was even more surprised to hear that the butter and the spread are all whipped in-house! So far I've been impressed with the superficial details, now let's get to the core of this post: the food. 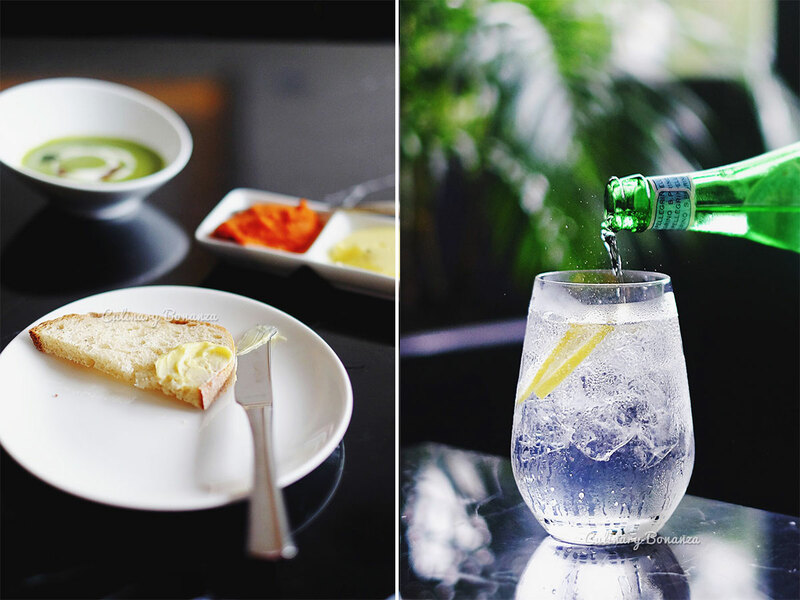 Monty's serves modern European cuisine with some Nordic influences, because the Executive Chef Christer Foldnes is a Norwegian after all. Some of the very Nordic dishes which you'll find on the menu are: Pickled & Smoked Herring and Norwegian Salmon (see the photos below). Some of the dishes, from the Soups & Salads to the Dessert, are interestingly very healthy and suitable for those on protein or gluten free diet. (photo above) Organic Kale & Green Pea Soup with sour cream, black mustard, caviar & fresh mint. Nothing screams 'healthy superfood' like kale does! I've eaten it as green smoothies (not very appetizing to be honest), but as a soup served with sour cream and caviar, it will whet your appetite for the next courses. (photo above) Chopped Salad - turkey, chickpeas, cucumber, tomato, green beans, red onion & lemon aioli dressing. Now, Lachanophobes (people who has phobia of vegetables), if you fear the sight of large eared leafy greens, this chopped version might just convert you into a believer. The crunchy and juicy, easy to chew salad is one of the signature of Monty's. God must have been 'high' when He created truffle mushrooms...haha, just kidding (religious groups, please do not prosecute me!). Anyway, this Truffled Cheese Souffle is my favourite of all the dishes that we tried at Monty's. It's perfect for me in all aspects: crusty yet thin cheesy crust with custard-like cheese underneath and the truffle scent is just intoxicating. It really took all of my strength to let the staff take away the unfinished souffle! But I knew I had to save some room for the (still) long journey LOL. (photo above) 4 hours Roasted Pork Belly with coriander yogurt, pickled carrot, beets & toasted, chopped cashew. The pork belly was tender, but not as juicy or slick as the other roasted pork belly I've had elsewhere. I supposed it's got to do with the leaner cut served here. It's still delectable nonetheless. (photo above) Pickled & Smoked Herring with rye bread, pearl onion, baby potatoes & sour cream. 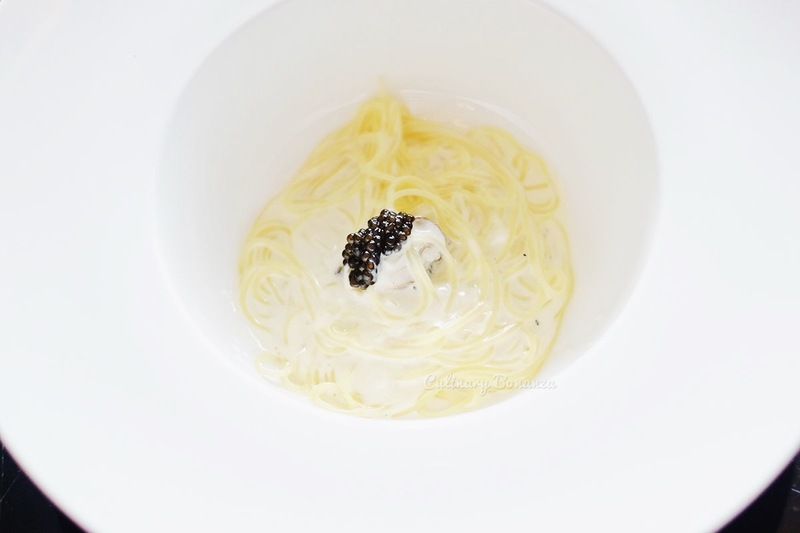 (photo above) Champagne & Oyster Angel Hair - champagne cream sauce, poached oysters. (photo above) OBE Organic Beef Cheek Bourguignon braised in red wine for 5-6 hours, shallots, purple carrot, mushrooms & parsley. I had this divine dish sometime ago at one of Jakarta's 5 star hotels, so obviously, I had a rather high expectations for Monty's rendition. Fortunately, I was not diappointed, it's as tender as the name implies and guilty as sin. This particular dessert, I'm pretty sure is going to be a hit on the social media, because it looks so catchy. 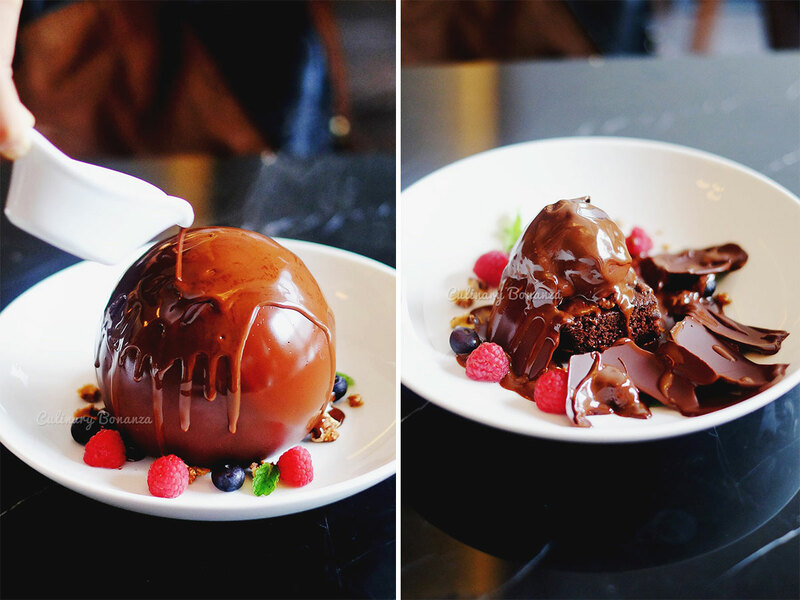 A dome of chocolate, appears before you and then the staff will pour a pot of sizzling hot, liquid whiskey chocolate on it, to reveal a ball of chocolate coated vanilla ice cream sitting snugly on top of a sticky toffee - chocolate pudding. Be warned sweet tooths, this is quite a sweet number, perhaps better enjoyed with a cup of black coffee. (photo above) Dark Chocolate & Chili - chili flavoured, flourless, dark chocolate cake, with raspberries & vanilla ice cream. Apart from that spicy kick, this luscious chocolate cake is gluten free (but not vegan).